You guys, I have to admit something to you. Even though I’ve been scheduling posts for Mondays, Wednesdays, and Fridays, as usual, I wondered if you noticed that something seemed “off” around here. I mean, I’ve been posting a lot of round-ups lately. That’s all well and good and a great way to discover new blogs, but I usually make them filler posts from time-to-time. Not a constant occurrence. I had been going through a bit of an uninspired blogging rut. It happens. Thankfully, this one was pretty easy to get myself out of. All it took was a little downtime and a lot of fresh air! Monday morning, I was ready to get back to it! Sunday afternoon was spent outside on the deck planning my week ahead. I woke up on Monday, got myself ready, and headed to the farmer’s market bright and early. You know what I love about the farmer’s market? The produce is fresh and you can get so much for so little! And I did! For $20, our fridge is stocked! Since it’s officially salad season around here, I’ve been making all sorts of dinner salads to either eat as meals or with a meal. 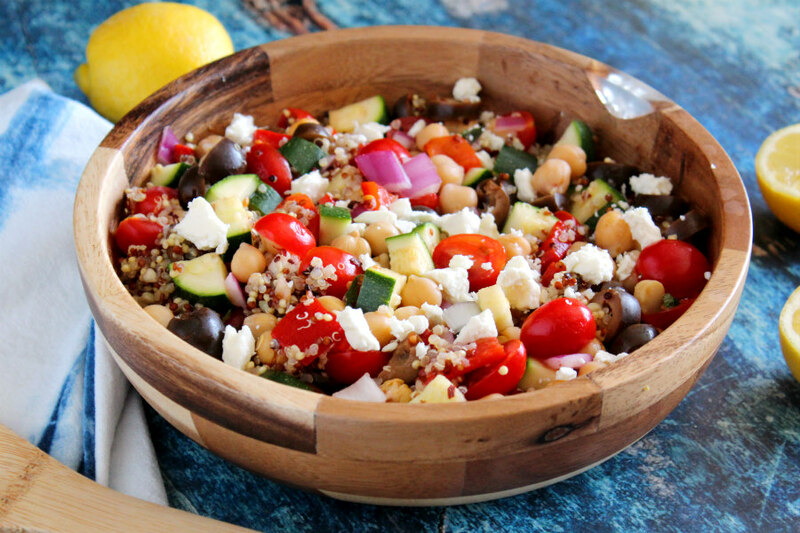 With all of the veggies that I bought, I knew I could put together one of my new favorite quinoa-based salads. It’s one that I can’t believe I haven’t shared on the blog before! I’m basically obsessed with cooking with quinoa these days. It’s full of protein, fiber, and all sorts of good stuff! 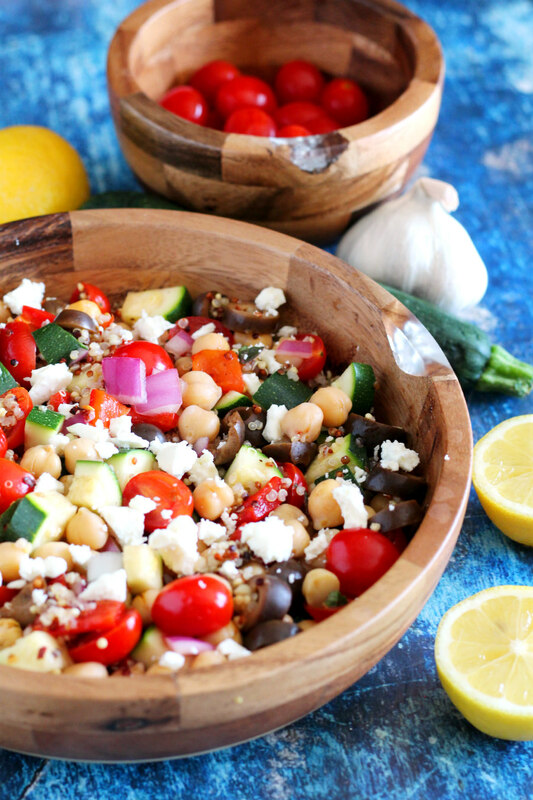 Like rice, it’s a great base for building flavors, which is why I love using it in salads! 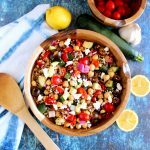 this Mediterranean Quinoa Salad originally happened one afternoon when I needed to clean out the fridge. Sometimes, the best food creations seem to happen at random. Don’t they? 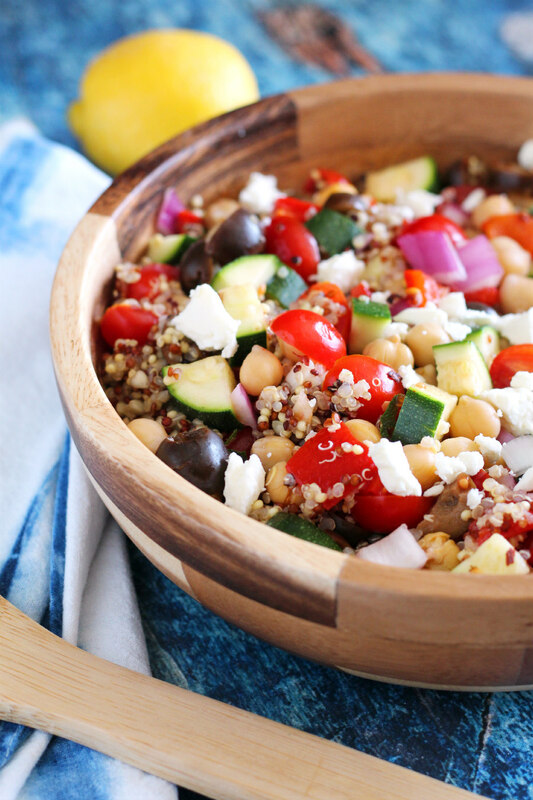 So I whipped up a batch of quinoa and started adding all sorts of colorful veggies and a can of chickpeas to a bowl. When the quinoa cooled down, I mixed it into the bowl. There isn’t any fancy dressing on this salad. All it needed was a little lemon juice and olive oil to do the trick! 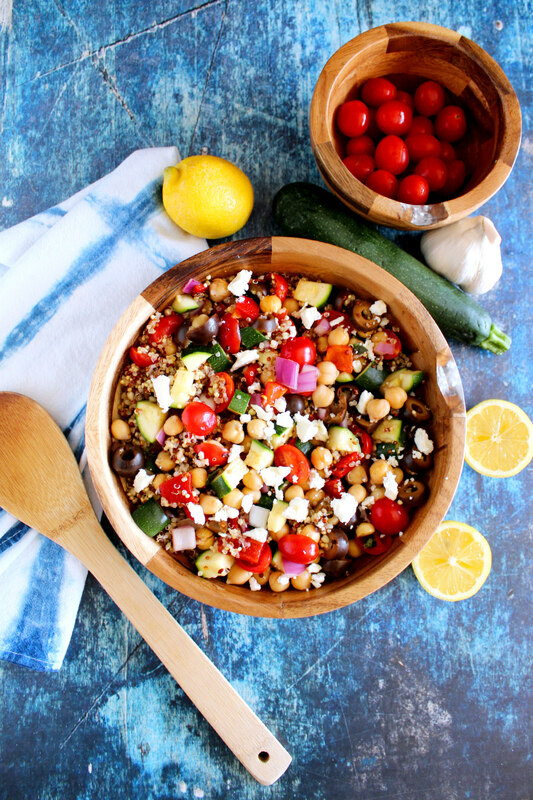 Top it off with some crumbled feta and boom! 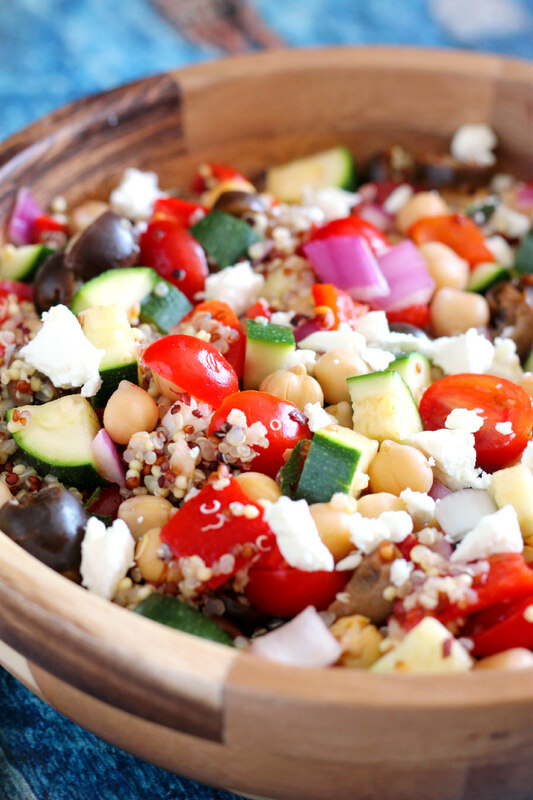 You’ve got yourself one hell of a healthy salad that you’ll want to eat all week! Add 1/2 cup of quinoa to 1 cup of water. Bring to a boil, then lower temperature. Cook until water has been fully absorbed, about 10-15 minutes. Remove from heat and allow to cool. Prep all other ingredients, except for the last 5 ingredients, and add to a large bowl. When the quinoa has cooled, add it to the bowl and mix. Juice the lemon and add it to the bowl with a drizzle of olive oil. Season with salt and pepper (plus, a sprinkle of red pepper flakes, if desired) and stir to combine. Add crumbled feta cheese on top before serving. If not serving immediately, chill in the fridge in a covered container. It’s got awesome, fresh flavor and a whole lot of crunch. It might be full of healthy stuff, but your taste buds will be far from bored eating this! Plus, I totally believe in the saying that we “eat with our eyes” first. I mean, look at all of that color! Come on! It’s pretty! This is definitely a salad that’s worth making ahead of time. It gets better after a day or two. It’ll make a big batch, so if you’re into meal prepping, this is perfect for it! You can easily add some grilled chicken to it to make it a complete meal. During the summer, this will be great to bring to barbecues or to use up veggies from your garden. I mean, it’s not that expensive to make, but with garden veggies, it’ll be a super budget-friendly meal or side dish! It doesn’t get fresher (or tastier) than that! Oh, and my biggest selling point is that my sometimes picky husband will eat this for days! Winner, winner, quinoa dinner!